All our appetizers are served with mint chutney and a sweet chutney. The mint chutney is a dip made of coriander, mint, chilies, salt, and lemon juice blended together with other secret ingredients. The sweet chutney is a dip made with tamarind, sugar, and spices. Mashed potatoes with peas fried. Cubes of cottage cheese deep fried in a flour batter with spices. Cubes of potatoes seasoned with spices and herbs. A combination of samosa, paneer and vegetable pakora, and vegetable cutlet. A combination of samosa, vegetable and chooze pakora, and seekh kabob. Tandoori chicken, seekh kabob, chicken tikka served with sizzling grilled onions. Crisp lettuce tossed with chopped onions, tomatoes, vegetables, herbs, and mild Indian spices. Chicken stock with a blend of spices. Chicken, served with grilled onions. Skinless breasts deboned, served with grilled onions and lemon. Skinless breasts, deboned and marinated in mild spices, herbs, and mint. Choice minced lamb seasoned and barbecued on skewers in the clay oven. Cubes of chicken tikka and seekh cooked with bell peppers, mild and exotic Indian spices. Fillets of cod marinated, seasoned with mild spices and herbs. Jumbo shrimp marinated in mild spices and herbs, served with grilled onions. Tandoori chicken, seekh kabob, chicken tikka, butter chicken, dal makhni, vegetable curry, peas pulao, dessert. Tandoori chicken, seekh kabob, chicken tikka, vegetable curry, naan, peas pulao, and a dessert. One naan and a small portion of white rice can be ordered with any entrée for $3.00. Cubes of lamb leg deboned in seasoned onion and tomato gravy. 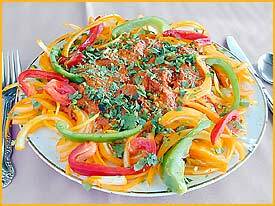 Cooked in onion, tomatoes, and mild gravy, garnished with fresh bell peppers and chopped coriander. Minced lamb cooked in onion and tomato gravy, coriander. Cooked in spicy onion, tomatoes, and potatoes. Cooked with fresh spinach, onions, tomatoes, and ground spice. Cooked in a spiced creamed lentils. Pieces of seekh kabob in gravy. Cooked in a spiced onion, tomato, and cream gravy. Chicken cooked in onion, tomato, and cream gravy, seasoned with herbs. Boneless and shredded chicken cooked in cream, onion, and tomato gravy. Boneless, cooked in traditional onion and tomato gravy. Tender pieces cooked with onions, peppers, spices, and herbs. Beans and potatoes sautéed in spices. Cottage cheese cooked in a tomato, onion, and spiced cream. Cooked with spinach in a spiced onion, cream, and tomato. Cooked in onion and tomato gravy. Eggplant barbecued in clay oven, mashed and seasoned with herbs and exotic spices, and sautéed with onions and tomatoes. Cottage cheese and vegetable balls cooked in spiced onion, cream, and tomatoes. Lentils cooked in a spiced onion and tomato cream gravy. Cottage cheese cooked with spring onions, bell peppers, Indian spices, and herbs. Bell pepper and potatoes sautéed in onion and tomato gravy. Cottage cheese and bell pepper sautéed in fresh Indian spices. Chick peas and fried bread. Whipped yogurt with onions, tomatoes, and cucumbers. Basmati rice cooked with peas and sautéed with seasonings. Basmati rice cooked lamb, shrimp, chicken with mild spices and herbs, garnished with tomatoes and bell pepper. Leavened bread with fresh garlic. Leavened bread made in clay oven. Unleavened whole wheat bread made with butter and made in a clay oven. Leavened bread stuffed with grated cottage cheese, chopped coriander, and mild spices. Unleavened whole wheat bread stuffed with mashed potatoes, made in a clay oven. Steamed Indian cheese patties, cookie richly flavored cream sauce with chopped nuts. A delicacy made with dough, served in rose flavored sugar syrup. Carrot cake, garnished with nuts.